The Smart Mirror technology allows customers to try on new frames, take pictures or videos, compare them side by side, and get instant feedback from friends or family. This way TSO Fort Worth opticians can ensure our customers are happy with the frame choice and enhance their eyewear shopping experience. The Smart Mirror also allows Texas State Optical Forth Worth opticians to assist our clients select optimal progressive lens design according to their comfortable reading distance. Instead of giving near vision tests at an average distance, this technology takes the patient’s precise reading distance. This measurement allows the opticians to adjust the inset, placing the near distance area in the most optimal position of the lens according to the patient’s comfortable reading distance. 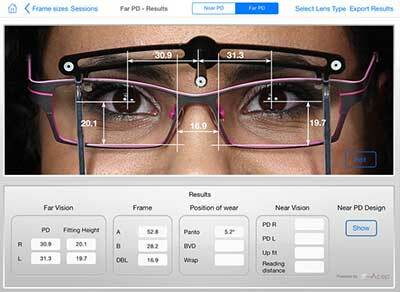 Our Fort Worth opticians can now help help patients see how their new lenses will perform. Taking measurements of necessary fitting parameters such as Distance and Near Monocular PD, Fitting height, Pantoscopic tilt, Vertex distance, Frame wrap, Reading distance, Inset, and recommending the best corridor length selection is easy and accurate with the Smart Mirror. Schedule an appointment today at TSO Fort Worth and let us help you choose the perfect frame and lens for your personal lifestyle.